UT Medical Center Nurse Erin Konecki recently graduated from the Federal Emergency Management Agency’s National Emergency Management Basic Academy in Columbus, Ohio. It was the first such program to be held in the state. 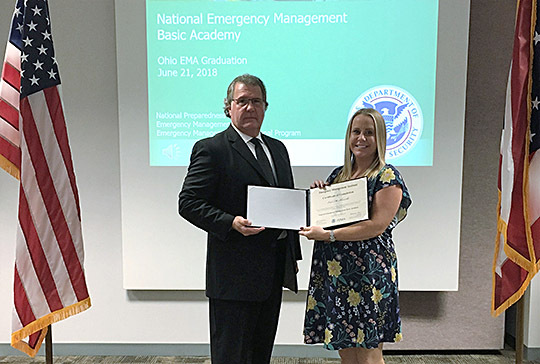 Erin Konecki posed for a photo with Daniel Kolcum, assistant director of the Ohio Emergency Management Agency, after graduating from National Emergency Management Basic Academy in June. FEMA is an agency of the United States Department of Homeland Security; its mission is to support citizens and first responders to ensure that the nation works together to build, sustain and improve the capability to prepare for, protect against, respond to, recover from, and mitigate all hazards. The National Emergency Basic Academy was created to produce a comprehensive curriculum that provides the foundational knowledge and skills needed to support the unpredictable challenges in the field of emergency management. It can be considered a gateway for those pursuing a career in emergency management and provides participants with the opportunity to build camaraderie and establish contacts for those new or transferring to the emergency management profession. It is the first phase of FEMA’s new Emergency Management Professional Program, which is designed to be a lifetime of learning for emergency managers. The program includes three separate but closely related training programs — the Basic Academy, the National Emergency Management Leaders Academy and the Executive Academy. Konecki finished the five required courses — Foundations in Emergency Management; Science of Disaster; Planning: Emergency Operations; Exercise Design; and Public Information and Warning. She also completed a total of 152 hours of training to graduate from the National Emergency Basic Academy. She is a registered and alternate lead nurse in UTMC’s Emergency Department. She also serves as the department’s clinical disaster liaison, working with the staff of the Safety and Health departments and the clinical staff members of the Emergency Department. She assists with disaster drill planning and other necessary tasks to ensure involvement of the nurses. Konecki received her bachelor’s degree in nursing from Lourdes University and basic EMT certification and national registry card through Owens Community College. She is also a 2018 graduate of the Master of Public Health Program at UT, where she majored in environmental and occupational health and safety science with a focus in disaster preparedness. Konecki said the academy taught her how to effectively plan drills while working with the Ohio Emergency Management Agency planners; improved her networking and public speaking skills; taught her how to anticipate and respond to disasters, and how to disseminate information to the public. Konecki plans to attend higher levels of the Emergency Management Professional Program as her career progresses. For more information about FEMA’s training and emergency management courses, visit training.fema.gov/empp. This entry was posted on Tuesday, September 11th, 2018 at 3:47 am and is filed under Alumni, News, UTMC, UToday .